While I don’t remember the news as clearly as I did that of the killing of Osama bin Laden, I do recall watching reports of the hijacking of the Maersk Alabama by Somali pirates and how the situation was resolved by Navy SEALs killing three and capturing a fourth pirate. Paul Greengrass dramatized the events in Captain Phillips, following the titular captain (Tom Hanks) as he dealt with his ship’s takeover and his own kidnapping. What the movie really reminded me of was last year’s Argo. At the beginning of the movie, the four pirates are shown taking part in the attack because they were coerced into it by their criminal boss. It was enough to make the pirates seem more human and thus easier to sympathize with. I’m curious as to how the movie would have felt if we couldn’t see that and the Somali pirates’ dialogue was unsubbed. They would’ve seemed more like wild animals, especially because of Bilal (Barkhad Abdirahman), a pirate who was addicted to khat and had some serious anger management issues. Even with Full Metal Jacket in mind, Captain Phillips was the most well-acted movie I have seen in a while. With movies like Forrest Gump (1993) and Saving Private Ryan (1998) under his belt, Tom Hanks firmly established himself as one of my all time favorite actors. 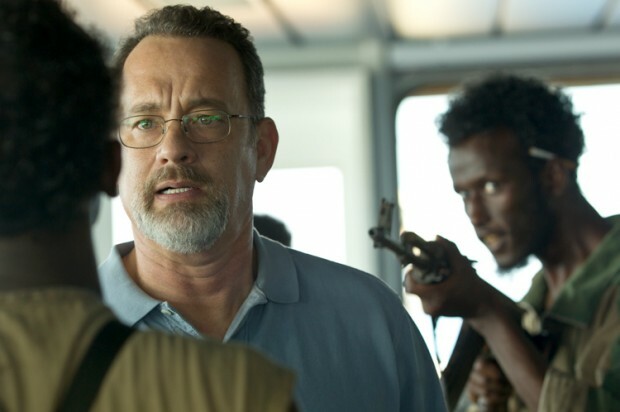 I think he did the impossible by giving his best performance yet as Captain Phillips. That said, I think the actors who played the pirates (Abdirahman, Barkhad Abdi, Faysal Ahmed, and Mahat M. Ali) also deserve their fair share of credit. Each succeeded in giving their respective character their unique personality, adding credibility to the events depicted onscreen. This is the first time I’ve seen a movie that is about a merchant marine ship, albeit one hijacked by pirates. For that reason, I did appreciate Greengrass treating us to a look into the life of a merchant mariner. The ship felt like an ordinary workplace without the shouting commanders that you see in naval warfare movies. As I type this review, I suddenly think about how this movie could easily have been one about the US Navy and how it rescued a hapless civilian freighter. Instead, it gave us perspectives from all parties involved, including that of the pirates. It was the movie that gave me arguably the fairest look at any issue that involved a conflict between an American and someone foreign. Captain Phillips is generally the most intelligent thriller I have seen in a while. The movie took place almost entirely in sea, and thus could have easily fallen into the trap Thunderball did, but Paul Greengrass knew how to use his setting to remind us how alone the Alabama was out in the waters off the coast of Africa. I also have finally seen a movie that I can definitively say topped Pacific Rim as the best movie of 2013 I have seen so far.